On Bilbo or Frodo Baggins hairy toes and feet may be cute, even fetching. On the rest of us non-hobbit folk, not so much. Some amount of hair on the feet and hands is normal. Men with dark hair, or who are particularly hairy on the rest of their body can have prominent hair on the knuckles and the toes and feet. Some men can find that to be embarrassing. Excessive hair on the feet and toes of a woman can be decidedly unattractive and a real cause for self-consciousness. To understand excessive hair growth on the toes and feet it is important to understand how and why hair grows on all of the body. There are two kinds of hair on the body, vellus hair and terminal hair. Vellus hair is the soft downy nearly invisible hair found on the bodies of most women. Hormones usually at the time of puberty trigger vellus hair to become terminal hair. Terminal hair is the hair on our heads, and under the arms and pubic regions of both men and women. 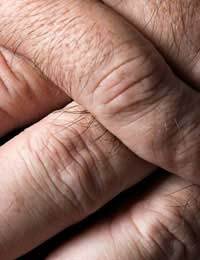 Male hormones (Androgens) cause vellus hairs in men to transform to terminal hairs on the face, chest, back, and yes knuckles and feet. Sometimes in women, vellus hair also is triggered to become terminal hair, and these women can experience excessive hair growth in unwanted areas such as the face and the hands and toes. Noticeable hair on the feet and toes in women isn't always terminal hair; it can just be particularly dark vellus hair. In either case hair grows in cycles. When a hair follicle completes the growth cycle it releases that hair, and it goes into a dormant or resting stage as that follicle rejuvenates and grows new hair. It is important to understand hair growth cycles so you can find the best way to remove unwanted hair. It is unlikely that hair on the feet is indicative of a hormonal problem. However, since excessive hair growth in women in areas normally more common in men such as the chest or face, can indicate a hormonal issue, any woman experiencing excessive hair growth anywhere on her body should consult physician. Like unwanted hair anywhere on the body, the simplest and most direct way of removing hair from the feet and toes is by shaving. An electric razor will reduce irritation. While shaving your legs it is a simple matter to just continue on down to the feet. The idea that shaving anywhere actually stimulates hair growth is poppycock. The same methods also used to remove unwanted and unsightly hairs on other parts of the body have also been used to remove hair on the feet and toes. These methods can include:Waxing Waxing can remove unwanted hair form the toes for a much longer periods than saving. Most salons offer wax hair removal of the feet, which is recommended as applying the hot wax yourself at home can result injury. Bleaching and Chemical Depilatories - have also been shown to be effective in removing unwanted hair form the feet and toes. Laser hair removal - practiced by some spas and medical professionals, laser hair removal can be used on the feet and hands as it has been on other parts of the body. However despite claims to the contrary, while laser hair removal is effective it is seldom is permanent and may require re-treatments. As in removing unwanted hair from the face or any other part of your body the only clinically proven safe and effective method of permanently removing hair from the feet and toes is electrolysis. During electrolysis a trained medical professional will insert tiny needles directly into the hair follicle that deliver microbursts of electricity which permanently destroy that follicles ability to re-grow hair. As each hair must be killed off individually and only a few can be done at a time, electrolysis may take several sessions depending on how much hair on the feet needs to be removed.